Thousands of people from 12 villages near the volcano located in North Sumatra’s Karo regency were forced to flee their homes after Mount Sinabung erupted on Sunday, it’s first eruption since 2010, reports said. The volcano erupted at at 2:45 a.m. local time and continued to eject volcanic matter for at least 7 hours. “There is the potential for another eruption; therefore, we are calling on people to remain alert,” said the Geological Disaster Mitigation and Volcanology Center (PVMBG). Mt Sinabung erupted in August 2010 after 410 years of dormancy. The eruption claimed a dozen lives and displaced thousands of others. The eruption which occurred on August 29, 2010 was followed by a more powerful explosion the next day, and much stronger blast on September 7, 2010. Mount Sinabung spewing volcanic ashes as seen from Simpang Empat Village in Karo, North Sumatera (9/15). Credit: ANTARA/Septianda Perdana. The PVMBG categorizes Sinabung as a type A volcano, or those that have erupted since 1600. 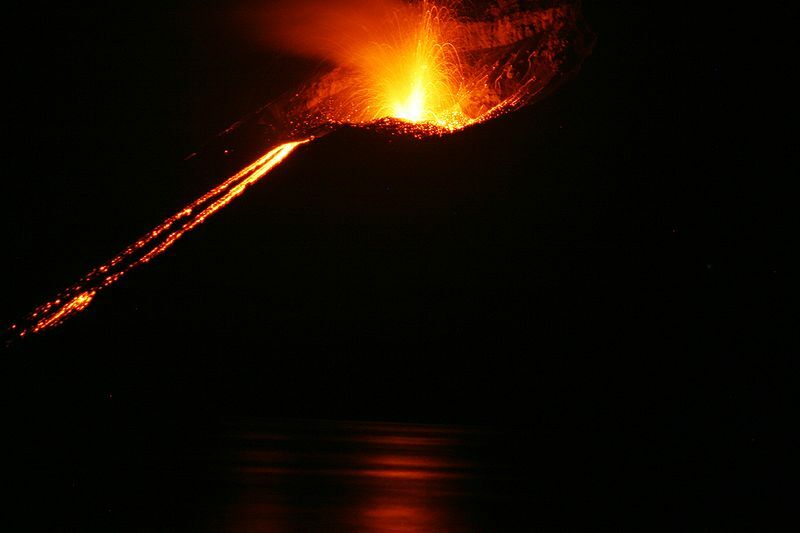 Type B volcanoes have not erupted since 1600 but show signs of activity, and type C are those that have not erupted in recorded history, said a report. Mount Rokatenda, located on the small island of Palue about 2,000km east of Jakarta, erupted spewing ash and rocks more than 2,000 meter into the air. Hot ash and lava from the eruption fell on a nearby beach, killing at least 6 people including 2 children, officials said. Rokatenda has been restive since last October, forcing the evacuation of hundreds of villagers. The eruption started at 04:27 on Saturday (20:27 UTC Friday) and lasted for about 4 hours, according to the National Disaster Mitigation Agency. Mount Rokatenda is one of about 130 active volcanoes in Indonesia, an archipelago of more than 17,000 islands. 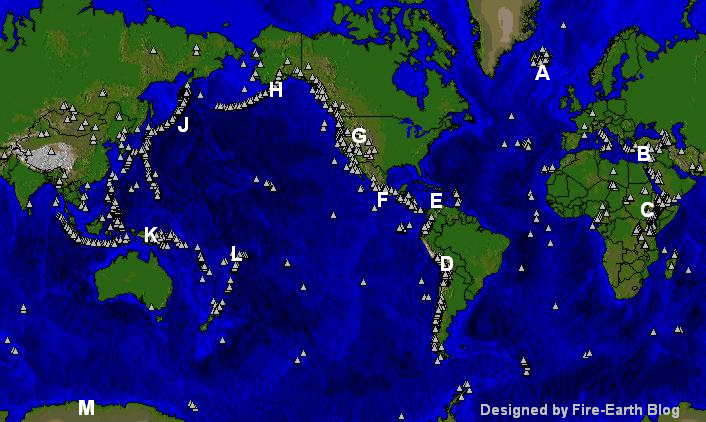 Much of the country sits along the Pacific “Ring of Fire,” an area crisscrossed by numerous fault lines and prone to earthquakes and volcanic activity. Mount Merapi’s 2010 eruption in central Java left up to 400 people dead and more than 250,000 others displaced. Mt Merapi volcano’s latest salvo of eruptions began on October 26, 2010. On Thursday, it blasted hot ash and poisonous volcanic fumes into the air, killing about 70 more people, reports say. The blast has burned villages up to 15km (9 miles) from the summit crater. Indonesian President Bambang declared the eruption a national disaster on Friday. Up to 100,000 people have now abandoned dozens of villages on the slopes of the volcano. The death toll from the continual 10-day eruption has now climbed to at least 115. Download large image (2 MB, JPEG) — Image acquired November 1, 2010 – Posted on November 5, 2010. ASTER on NASA’s Terra satellite captured the thermal signature of hot ash and rock and a glowing lava dome on October 30. 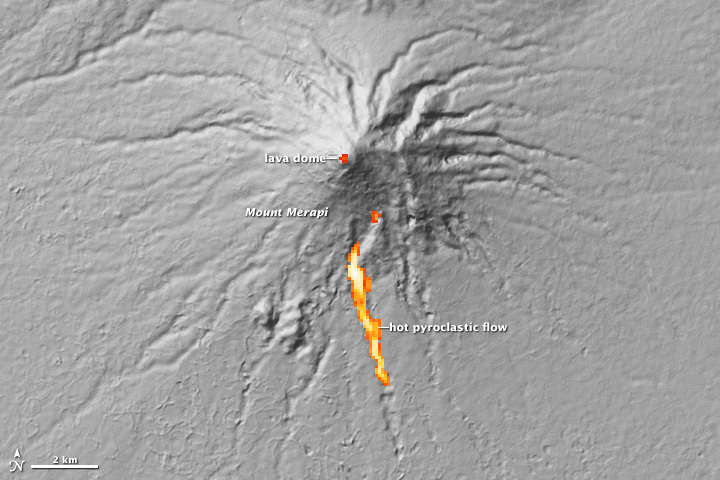 The thermal data is overlaid on a three-dimensional map of the volcano to show the approximate location of the flow. The three-dimensional data is from a global topographic model created using ASTER stereo observations. 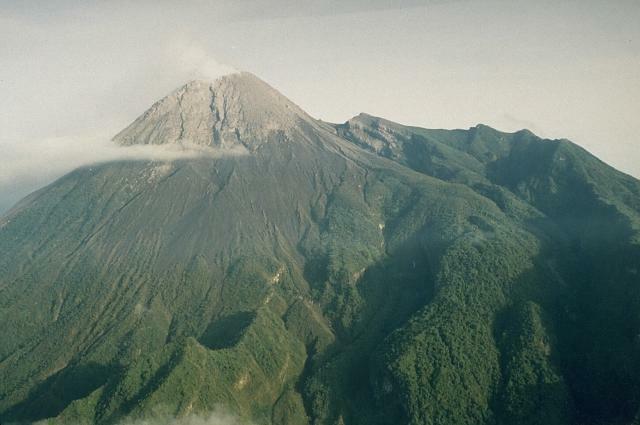 Merapi shows no signs of slowing. After several days of eruptive episodes, the volcano began an eruption on November 3 that was five times more intense than on October 26 and lasted more than 24 hours. It is the most violent eruption at the volcano since the 1870s, said local geologists. (Source: NASA-EO). 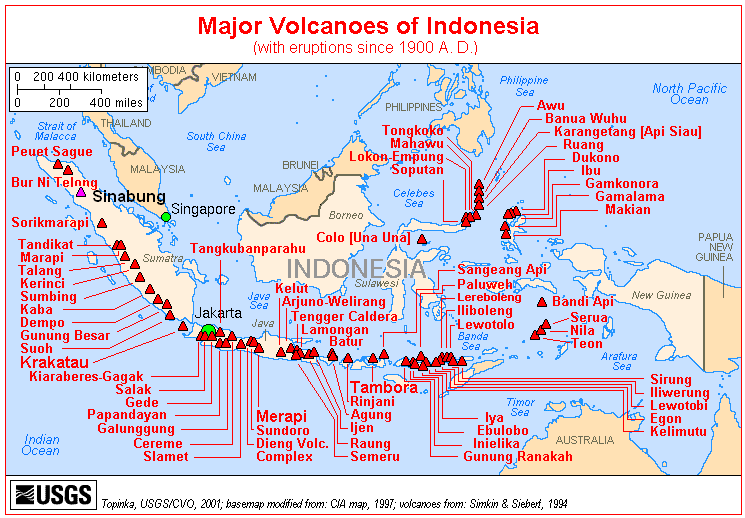 Mt Sinabung, Krakatau and Merapi Volcanoes Location Map. Source of the original map: USGS. Map enhanced by Fire-Earth. Click image to enlarge.